You know what we needed in a world where people can already find out way too much about us online? 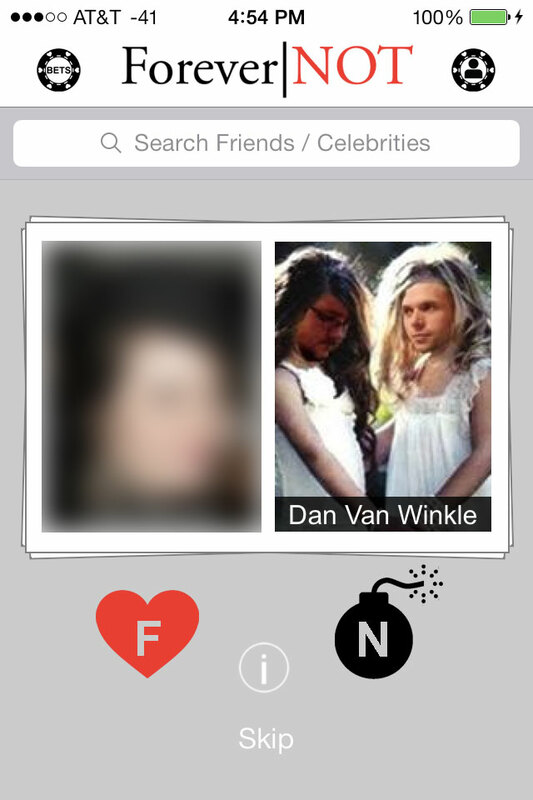 An app that lets us bet on whether or not our Facebook friends’ relationships will last. Thanks, Forever|NOT. Now, cynics have an easy platform to pass judgment on other people, which I guess isn’t surprising, since that basically describes the Internet. Of course I, being on my way toward marriage later this year, immediately checked my own relationship rating after downloading the thing to write some Internet about it. The app pulls your Facebook friends who are in relationships up on the screen (and celebrities, but is anyone really going to use it for that? ), and you anonymously decide if they’re going to stay together or not “Hot or Not” style by swiping right or left to bet. I bet “Forever” on my own profile (you know, just to test the thing out and not at all out of romantic narcisism) before thinking to look for the statistics button, so now I’ll never know if we had other votes before mine and whether or not they influenced our only 98% positive rating. You get off easy this time, Facebook friends. As a note, I also voted on a definitely unrated couple just to see what happened, and my one positive vote only gave them 88% positive, so maybe there’s some kind of complex algorithm involved that gives your vote a different weight based on how long it took to decide and whether you needed to check the couple’s profile out first. I don’t know specifics, but there’s obviously some kind of system for how much a vote matters. Either that, or the app is deliberately geared to make you insecure, which wouldn’t surprise me, either. Anyway, the whole thing is pretty creepy in its presentation. I know, all of the data that shows up on it is already available to Facebook friends. The app just pools it together for them in a weirdly gross relationship stat sheet. It also pulls up the most recent pictures of the happy (or not happy) couple for you to browse and make your decision if you really have a cold enough heart to want to get that deep into it. Again, I know, I signed up for Facebook and willingly put all of this information out there for my friends to see, but seeing it all pooled together into some kind of interpersonal betting scorecard is more than a little dehumanizing. It’s certainly their right to do it, but I think the world would have been better off without it.